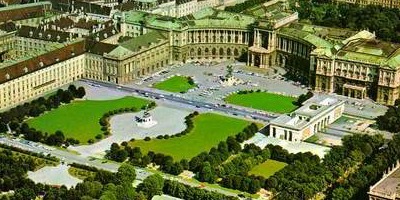 The extensive Hofburg palace was the bastion of the House of Habsburg monarchs of Austria for more than six centuries from 1276 until the fall of the Habsburg monarchy in 1918. The Palace, located in the Centre of Vienna, contains 18 wings, with a total of 2550 rooms and 19 courtyards. The whole complex is about 240,000 m² in size and is decorated in a wide variety of architectural styles, from Gothic to baroque to neo-classicism. You can visit the Kaiserappartements, the Spanish riding school and the Burggarten to make your visti complete. Until 1918 the imperial family lived in the Hofburg Palace. Nowadays only the Neue Burg, the official presidential residence, is of political value. The Hofburg Imperial Palace was built in 1275 as a medieval castle by King Ottokar II of Bohemia, who was also Duke of Austria. For over 600 years, the castle was expanded into a huge palace complex. The construction of the complex you can admire today was started by Ferdinand I in 1533. He decided to move his main residence to Vienna, making this city the capital of the Holy Roman Empire. Famous inhabitants of the Hofburg Palace were Empress Maria Theresa, Emperor Franz Joseph and Empress Elisabeth. It was then used as a winter residence, while Schönbrunn was the summer palace. A highlight is a tour around the Kaiserappartements, the Imperial Apartments. There are 22 rooms you can visit including the rooms of Empress Elisabeth, the bedroom, dressing room and a fitness room with its wooden fitness equipment. In the Imperial rooms you can also find Sissi’s own bathroom, which she had built in 1876. It was the first bathroom in the Palace, the rest of the family washed themselves in a tub behind a folding screen. In the grand salon you can admire the famous painting of Sisi with stars in her hair. The apartments provide a picture of the daily life of Emperor Franz-Joseph and his wife Elisabeth (Sisi). In the Silver room you can imagine how the imperial family dined as the eating utensils of the Habsburgs are on display there. 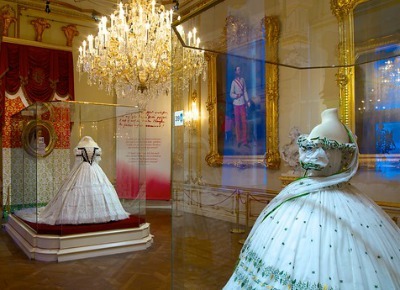 Sisi's dresses, or replica's of them, are at display at the Sisi Museum, together with her bathrobe, umbrella, fans and gloves. 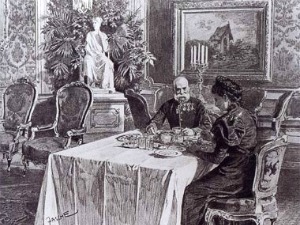 Emperor Franz Joseph and Empress Elisabeth having breakfest in the Hofburg, painted by Theo Zasche. 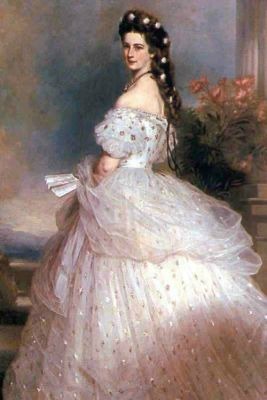 The famous painting by Wintertahler showing Empress Elisabeth with diamond stars in her hair. In the 15th century the Burgkapelle was added to the Hofburg. This was originally a chapel, but nowadays it is a concert hall, home to the famous Wiener Saenger Knaben (Vienna Boys Choir). If they are not on tour, you can listen to them here during the high mass on Sunday morning. For more information and concert dates visit their website. 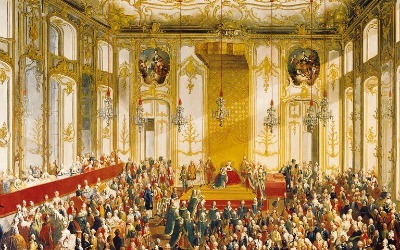 Court Banquet in the Great Antechamber of the Hofburg Palace. 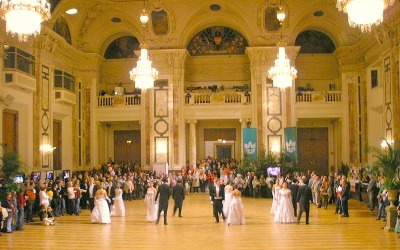 Nowadays there are still balls in the ballroom of the Hofburg. 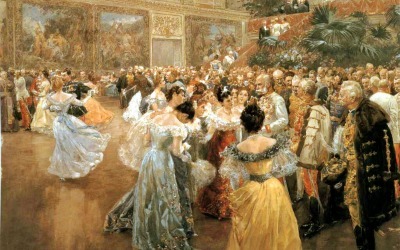 Hofball in Vienna by Wilhelm Gause. Emperor Franz Jospeh surrounded by ladies. Another tip for your visit to the Hofburg Palace: The Spanish riding school. You can check out the training of the lipizzaner horses of the Spanish riding school from Tuesday to Saturday from 10.00-12.00, or better yet: visit the gala performance on Sunday’s. 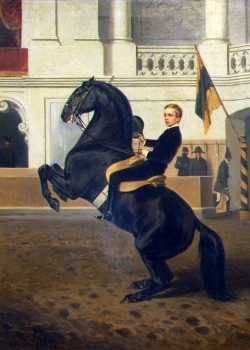 The Spanish riding school in Vienna is the last and oldest riding school where the classical horsemanship is still exercised. The training starts, both for horse and rider, at a young age and takes years. The goal is to achieve a complete harmony between horse and rider. Please note: in the summer months of July and August, the Spanish riding school closed. Take a look at the website to find out dates, times and prices. With a Vienna card you can get a discount. 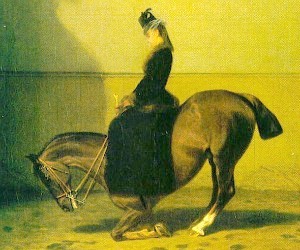 Empress Elisabeth on horseback at the Vienna Spanish riding School. 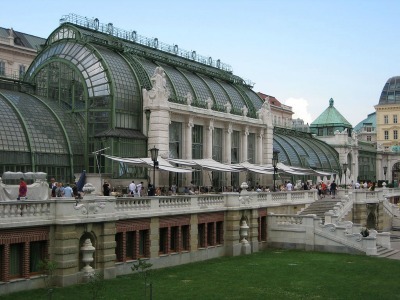 The beautiful and an elegant Palm House is designed by Friedrich Ohmann in the art nouveau style. It was built between 1901 and 1907 as greenhouse. Nowadays it houses a popular café. In the left part of the Palmenhaus (Palm House) is the Schmettlerlinghaus, a butterfly garden where you can see tropical butterflies and even bats. Other highlights: the treasure room containing the Crown jewels, the Sissi Museum, the silver room, the national library and the Burgkapelle. 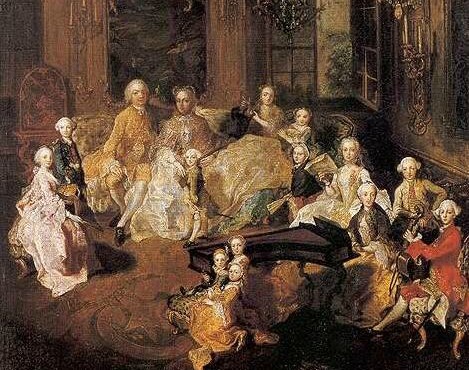 Combine a visit to Schönbrunn, the Hofburg and the Imperial Furniture Collection.
! Enjoy 48 or 72 hours of free ride on the Vienna's underground, trams and buses, as well as more than 210 discounts for museums and sightseeing, concerts and theatres, in cafés, restaurants and heuriger, and shops. And all for just €18.90 (48 hours) or €21.90 (72 hours) – with Vienna's official City Card.